(Trieste, Italy)- The third act of the Italian J/70 Cup will be taking place this weekend off the beautiful, exotic Italian resort on the Adriatic Sea. Hosting the twenty-boat fleet will be the YC Trieste off their fabled harbor in Trieste. Four nations are represented- Italy, Poland, Russia, & Switzerland. A number of the top Italian crews in the season-long series are represented, such as Claudia Rossi’s LA PETITE TERRIBLE, Gianfranco Noe’s CALVI NETWORK, Pietro de Luca’s ENJOY 1.0, Paolo Tomsic’s LA FEMME TERRIBLE, Vittorio di Mauro’s PLAN B, and Luca Domenici’s NOTARO TEAM. The leading Russian teams include Denis Cherevatenko’s JOYFULL and Dmitriy Shunin’s GOLDEN WING. The lone crew from Poland is Pawel Oskroboa’s CELLFAST and from Switzerland is Tom Studer’s JERRY. 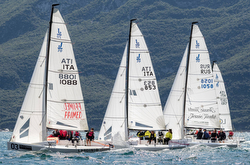 For more Italian J/70 Cup sailing information Add to Flipboard Magazine.